“Most people, asked whether parent involvement benefits children academically, would say ‘of course it does,’” Robinson and Harris wrote. “But evidence from our research suggests otherwise. In fact, most forms of parental involvement … do not improve student achievement. In some cases, they may actually hinder it.” This finding was fairly consistent, they noted, regardless of race, ethnic background or socioeconomic status. Ever since a new report claiming that parent involvement is overrated was released to a flurry of media coverage last month, people have been asking us for a response. We hope you find our analysis helpful in responding to questions about why our work to engage families is important. Does parent involvement make a difference in children’s learning? In a new study, The Broken Compass, sociologists Keith Robinson and Angel Harris argue that when parents attempt to help, they have little impact on, and may even harm, their children’s grades and test scores. Their conclusion is, at best, only half right. By limiting their analysis to data from federal and state surveys of parents, the authors missed an important body of research showing real gains for students when schools use well-designed strategies and practices to engage families in improving student learning. Yes, conventional parent involvement activities such as attending school events, meeting with teachers, helping with homework, joining the PTA, and volunteering, may have little or no impact on student test scores. Why? Because these practices often are not directly connected to what children are learning and doing in class or part of a systemic strategy to improve student learning. In fact, we’ve known for years that “random acts of parent involvement” have little effect on student performance. What do have an impact, however, are innovative family engagement practices that build close collaborations between parents and teachers and share effective strategies for strengthening students’ academic skills. Research that examines what we call “high-impact” practices to engage families in improving student achievement tells a very different story. This research documents what happens when schools support families’ efforts to encourage their children’s learning, monitor their progress, guide constructive use of out-of-school time, plan for post-secondary education and a career, and model life-long learning. 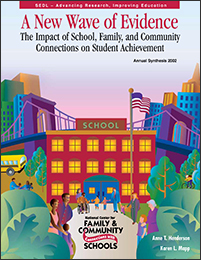 Our reviews of these studies find that intentional, well-designed practices to inform and support family engagement have a positive and long-term effect on student outcomes, including grades, test scores, behavior, passing rates, enrollment in higher-level programs, high school graduation, and college attendance. Robinson and Harris did not include this research in their analysis. Instead, they used data from federal surveys asking parents what they do (or don’t do) to support their children’s learning. These data are a mile wide and an inch deep. The surveys do not collect information on what, if anything, schools do from their side to make sure that the meetings, conferences, communications, and events that parents report they are involved in are actually helpful. In short, they cannot tell us whether the schools are offering parents meaningful opportunities to engage in a productive partnership or just going through the motions. The message that parent involvement doesn’t help children is not only misleading, but potentially damaging. For example, a widely publicized “finding” from The Broken Compass is that helping children with homework can backfire, actually harming student performance. All we can know from survey data is that homework help and low test scores are associated. It is probably more likely that parents’ attempts to help are in response to low achievement, not causing it. Instead of concluding that parents should stop helping their children, perhaps we should recommend that teachers equip parents with more effective strategies for strengthening students’ learning skills. Informed by the research about more effective practice, schools increasingly are adopting high-impact strategies for engaging families, and are having success in improving student achievement. What do these strategies look like? Link to Learning: High-impact practices are aligned with school and district achievement goals. Not only do teachers inform families what and how they are teaching, they share strategies families can use at home that are directly linked to the skills students need to learn at their age and grade level. Build Relationships: Developing respectful, trusting relationships between home and school fosters shared responsibility. For example, understanding families’ home cultures and the value they place on education, as well as listening to families’ concerns and ideas, allow teachers to tailor instruction to students needs and interests. Develop Dual Capacity: Providing training and professional development to teachers and families together so they can test out and apply new skills enables them to be confident, active and knowledgeable partners in the effort to improve student achievement. Robinson and Harris diagnosed the problem correctly – conventional approaches are ineffective — but they wrote the wrong prescription. Telling families to “set the stage and then leave it,” would only increase the disconnect between families and school staff. Instead, we should take advantage of evidence–based practices that show when parents and schools work together to form a seamless system of support, children thrive. There are plenty of effective strategies, but you wouldn’t know it from reading Robinson and Harris. Rather than step back, we should be encouraging parents to step up and lean forward, pressing schools to adopt practices to engage them that make a real difference in student achievement.